From October 10-12, I participated in the National Coalition for the Homeless’ Homeless Challenge. I spent 48 hours living on the streets disguised as an unhoused person—sleeping outside, panhandling, and walking blocks and blocks to access food, a bathroom, transportation, and other services. On our first night, my partner and I walked for hours in the rain. We slept in the rain with minimal coverage. My shoes and socks and waterproof jacket were soaked; my skin became like prunes. Despite the cardboard we collected, I shivered throughout the night, completely unprepared. I lay awake for hours. In the middle of the night, I got up, in need of a bathroom; I went to a fast food restaurant—like I have done in the past—but I was denied, even when I offered to purchase something. Shocked and discouraged, I walked to a fancy hotel, where I was given a key to the bathroom. For the first time that night, I felt like a human being. The next day, I experienced this similar feeling of overwhelming gratitude when strangers helped me. I was allowed to sleep on the floor of a worship center because it was raining, and two hours of sleep at night is not enough to compensate for all of the walking we had to do. A kind volunteer at a feeding program gave me crackers, peanut butter, and cookies. One woman slowed down her car and offered us a ride and food. In the afternoon, four or five strangers reached into their wallets and gave me what they could. I made $9.43 while panhandling, and I was relieved to know that I could eat again that day. In the evening, I was welcomed by a sit-down restaurant’s owners, despite the disgust of the other customers. A $5.00 salad had never tasted so good. Some people were less empathetic. I was kicked out of a fast food restaurant and into the rain on our second morning. Strangers sneered and laughed as they watched us. When we went to the library, I was sprayed with some sort of perfume (without my consent) due to the aroma I had acquired after not showering, applying deodorant, or brushing my teeth for three days. I recorded the names of the businesses that treated me like a second-class citizen (as well as those that treated me as human). I wanted to expose them and take revenge. They made me feel angry and lonely because they could not see past my stench and my grime and my grimace. They were privileged enough to ignore me, and they did. But what good would it do to retaliate? I, too, have not been compassionate enough, and I have allowed my prejudices to distort my view of the homeless. One woman, who sat across from me at a feeding program, talking to herself erratically, may have seemed strange to me before the Homeless Challenge. But when I really saw myself as her equal, and when I took the time to watch her get up and laugh as she danced to the music playing in the background, I thought she was beautiful. She had found her own happiness, amidst despair. I met some pretty amazing people on the streets. Unlike me, they could not quit homelessness after 48 hours. They were not able to pick up their belongings, reach into their wallets, and take a taxi home. They did not get to shower or wash their clothes. They could not shut the door, turn out the lights, and climb under my pink sheets and blankets. They were left outside to sleep on the concrete, vulnerable, exposed, and ignored. They did not choose to be homeless, and I hope I will never really know how difficult it can be. What I do know is that homelessness is a horrible situation. It is horrible after 24 hours, it is horrible after 48 hours, and I am guessing that it never really stops being horrible. No matter how many nice people and charities there are, no matter how appreciative I am of the people who helped me complete the Challenge, homelessness will always be horrible. We, as housed people, must do everything we can to eliminate homelessness and show the same compassion to those who helped and protected me on the streets. One way you could help is by asking your family and friends to donate to the National Coalition for the Homeless, perhaps even through a fundraising page like mine. You might also consider hosting events for National Hunger and Homelessness Awareness Week 2013 (November 16-24) to raise awareness in your community. For more information, visit the NCH website. No one should have to live the way that I did. Together we can end homelessness. 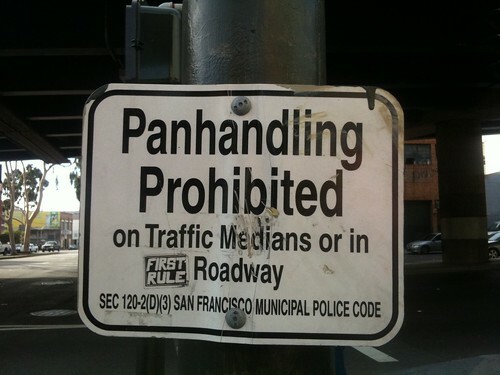 Subsequently, the Royal Oaks ordinance has been repealed and replaced with a prohibition on “aggressive” panhandling. The language of the 2011 law prohibits soliciting “in or near parks, playgrounds, banks, ATMs, bars, liquor stores, convenience stores and gas stations — or within 20 feet of an intersection or marked crosswalk, to people in parked or stopped vehicles, or to people standing in lines.” Although unstated in the laws review (article) The New Orleans prohibitions are similar to Royal Oaks prohibitions, in that they applied to public places and the regulation of speech in said area..
Johnston County, North Carolina approved panhandling regulations just two weeks ago. The county now requires solicitors to register for a permit to ask for money. Officials sated, “They’ll have to show a photo ID and pass a criminal background check. Upon appeal by the ACLU on the grounds that several provisions were unconstitutional, commissioners dropped all requirements that panhandlers renew their permits or pay a $20 fee each month. Neighboring Wake and Raleigh counties also began regulating panhandling, with the ACLU describing the measures as near criminalization. ACLU legal director Katy Parker said, “Panhandlers rarely possess a photo ID, which is a requirement for the permits in Raleigh, Wake County and Johnston County,” Further complicating matters for those who wish to file for public solicitation, permits purchased in Wake County must be renewed weekly. The Johnston county law is thought to only apply to public solicitors only, creating the same or similar scenario similar as seen in Arizona v. Boehler and Wilkinson v. Utah. Today’s guest post is from Dr. Norweeta Milburn, Professor at the Semel Institute for Neuroscience and Human Behavior at the University of California, Los Angeles. Dr. Milburn chaired the American Psychological Association’s (APA) 2009 Presidential Task Force on Psychology’s Contribution to End Homelessness. The task force released a great report, and NCH is proud to partner with the APA’s Public Interest Directorate to raise awareness among psychologists of how we can all work together to end homelessness. As I walk my daily early morning route up Westwood Avenue from the parking garage to my UCLA office in the old Neuropsychiatric Institute, it is impossible not to see what appears to be bundles of clothing in doorways are actually people sleeping. Homeless people have found a place to sleep that provides some security and shelter in the doorways of office buildings and store fronts in a relatively safe area. In the mild Southern California October evenings, the doorways do not seem like such a bad spot to spend the night, but people will still be there, layered deeper in their worn clothing, when our weather turns wet and cold. In the late afternoon, homeless people are sitting on benches or walking on the sidewalks; some are seriously mentally and actively psychotic, but some are not. Other homeless people come to Westwood to panhandle but do not sleep on the streets. There is a man that I exchange “hello, how are you and have a nice day” with every day who gets off a bus in the morning to walk to his “spot” to stand with a cup asking for donations. His cup says he is a homeless veteran. There are other homeless veterans on the street in wheelchairs. In the shadow of one of the world’s great universities, Westwood is no different from urban areas in many other cities where homeless people seem to be everywhere. Before we accept this as the inevitable result of the new normal, what can be done to move public policy further in the direction of ending homelessness? The American Psychological Association’s Task Force on Psychology’s Contribution to End Homelessness, it ‘s report “Helping People without Homes: The Role of Psychologists and Recommendations to Advance Training, Research, Practice and Policy,” advocates for federal legislation to create supportive housing and safe low-income housing across geographic areas (e.g., urban, suburban and rural) and for legislation that provides for mental health and a range of other needed services for homeless people: low-income housing, supplemental income, food and benefits. Even in this era of limited funding, the needs of people who are homeless cannot be ignored. What do I do personally? Sometimes I put money in their cups. I try to always acknowledge homeless people who approach me – say hello when greeted with a hello, and say sorry, no, when asked for spare change and don’t want to give it. I also carry granola bars in my car (as suggested by another psychologist). I wasn’t sure about this tactic, but one day after I had parked my car on the street, a rather sullen homeless young person sitting in a doorway by the parking spot asked for spare change. I said no, sorry, but asked if he would like a few granola bars. He actually perked up, lost his adolescent attitude and said yes. His entire demeanor changed – I don’t think it was just the food, it was the fact that another person had taken a few minutes to stop and connect with him. Sometimes that is all we can do daily – continue to remember that homeless people are fellow human beings just like us and those brief social connections do matter.